What is Gas Oil and what are the benefits to using it? If you’re a business looking to use gas oil (also known as red diesel) in your business and you’ve already checked that you’re legally authorised to purchase and use it. There are many benefits to making the switch which we will outline below. Gas Oil (red diesel) is an industrial diesel fuel used within the construction, agriculture and horticultural industries. The term ‘red diesel’ is commonly used to describe gas oil because of the red marker dye which is applied to it so that the authorities can trace its use. Over the years, the usage of red diesel has extended to data centres and hospitals as a reliable fuel for powering backup machinery and generators. It is a rebated diesel fuel, which means that it is taxed much less than regular diesel (road diesel) due to the restrictions behind its usage. This also explains the red dye which is mixed with it so that road users cannot use it in their road-going vehicles without being caught when tested. Gas oil is commonly created from petroleum. It is a fossil diesel which is derived from the fractional distillation of oil (crude). When crude oil is added to a large chamber (fractionating column) and distilled in this way, the lower part of the chamber has a much hotter atmosphere which cools as it rises to the upper part. At various height levels in the column, temperatures vary from the bottom to the top whereby the atmosphere cools towards the upper part. There are several condensers fitted at different height levels which capture the vapours of different substances produced under the corresponding conditions. Gas oil is one of the heavier substances which are created and it is collected near the lower level of the column, just above marine fuel oil and just below aviation fuel. Below marine fuel oil, a substance called bitumen is produced, which isn’t suitable as fuel and is commonly used for road surfaces instead. The lower part of the fractionating column produces substances which have a higher boiling point and lower volatility, whereas towards the top of the chamber substances with a lower boiling point and higher volatility are produced. 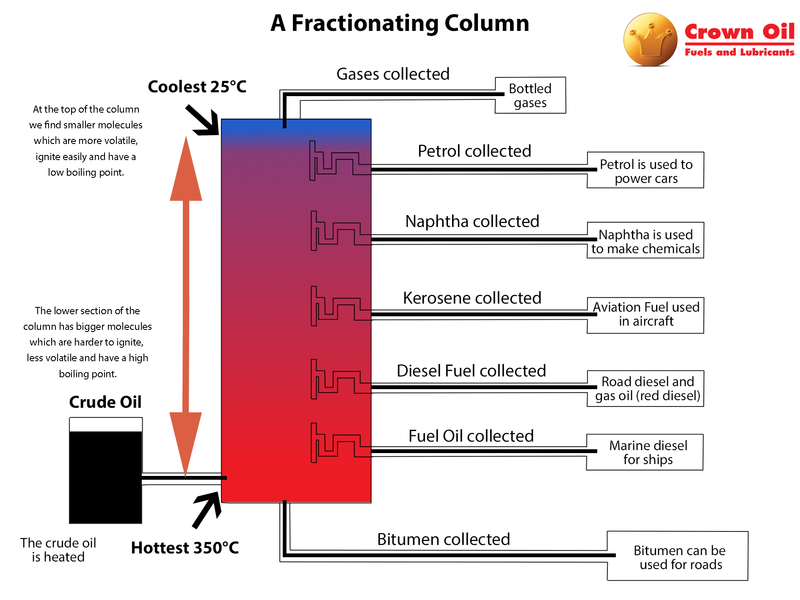 Click the image below to see an example of fractional distillation in the fractionating column. What does gas oil cost? The price of gas oil is much cheaper than regular road diesel which you pump into a diesel car because its purpose is for off-road use. The idea is to give relief to those using it for business rather than pleasure and recently, owners of pleasure craft; yachts and boats were refused the right to use gas-oil for propulsion. Although, gas oil can still be used onboard as fuel for light and heat. With daily changes to gas oil prices, it’s difficult to put an actual price on rebated fuel, however, as a rebated fuel supplier, we check against competitors prices daily to ensure our gas oil prices are the most competitive in the UK. Where can gas oil be purchased? You can buy gas oil from registered gas oil suppliers such as ourselves! You don’t need a license to purchase rebated fuel, but you must adhere to the legal use of it or you could end up with a huge fine or even imprisonment. The supplier of your gas oil must be registered with HMRC. As a nationwide gas oil supplier, Crown Oil can supply you with gas oil wherever you are in the UK at very competitive prices. Our priority focus is on customer care and timely deliveries although our oil is of the highest quality and our availability is second to none! 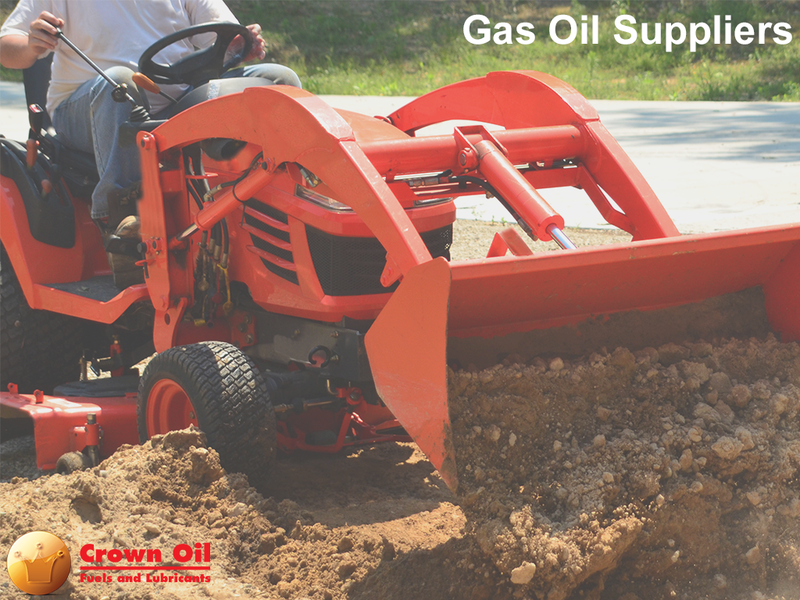 Gas oil cannot be used for road vehicles and does have rules which must be adhered to. You can take a look at our red diesel faq for a list of typical questions relating to rebated fuel or find a list of legal applications for red diesel fuel below. Recently the law changed to allow agricultural vehicles to use red diesel when they’re gritting the roads. Other than this scenario, an agricultural vehicle can only travel a specified distance on public roads using rebated fuel, usually to go from one field to another when no other route is possible. You can receive further advice from our advisors on 0845 313 0845 – call now for the latest gas oil prices, advice and availability. What to do next if you want to buy gas oil? We buy our stock in large quantities allowing us to pass on bulk savings to our customers. Our gas oil quotes are completely free. Why not find out how much we can supply gas oil to you for by using our simple fuel quote form. Flexible payment options allow you to order oil today and have it delivered when you need it, without having to make large payments upfront, especially if you order gas oil in bulk quantities. You can speak to us about our payment terms and how it can benefit your business on 0845 313 0845. Rebated fuel is widely used throughout the UK in varied industries and for different uses. Our promise is that no matter where you are in the UK, we can always supply you with quality gas oil. Our main HQ is in Manchester, however, we have depots across the UK, including London, Birmingham and Edinburgh to facilitate our nationwide gas oil distribution.